Also from SKT Australia is this pair, improved by half-plait (roo hide) handles. 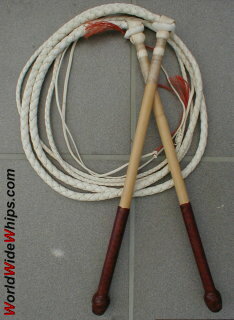 These whips combine the advantages of whitehides (robust by still being precise) with neat design. Selected, unpeeled kooboo canes were used for the handles, with an 8plait overlay on the hand part.